Hello, I wanted to be a little bit organised today and make a card that fits in with three challenges. Firstly I went over to the Muse challenge where this weeks Muse is Tracey McNeely with this beautiful card. I love the water coloured smooshed background and the scripty sentiment on Tracey's card and those PPP flowers are gorgeous. 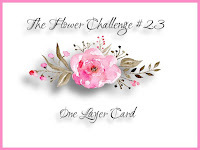 I kept my card one layer so I could also enter it into The Flower Challenge. I stamped the Happy Succulents stamp from Uniko in versamark and clear heat embossed it. Then I used my Zig clean color real brush markers to colour in the succulents and leaves and did some ink smooshing. My scripty sentiment is from Stampin Up Picture Perfect Birthday. 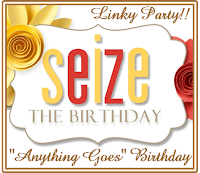 I am also entering this into the Seize the Birthday challenge where it is "anything goes". Here's my one layer birthday card. Thanks for looking and have a lovely weekend! Beautiful! I have this stamp and have always pictured it stamped in black, but it looks amazing in white! Thanks for joining us at Muse this week, Michelle! Stunning OLC Michalle. Loved the ink smooshed backgroun - beautiful colours. Michelle this is beautiful, I love that Pretty purple flowers against your smooshy background. Thank you for sharing at Muse this week! Lovely background for the lovely flower image. Thanks for sharing this beauty with us at Seize the Birthday. Ahhh Michelle I love love that background with these flowers. I need to go home and practice and think I will use your card to help me get that light watercolour look. I so struggle to get that sot look and it is amazing.